Tamarindo is one of the best beaches to learn to surf in Costa Rica, yet is also home to some of the most challenging surf sites in Guanacaste as well. So, it is no wonder the most popular activites in Tamarindo is surfing from Tamarindo beach, surf lessons at Tarmindo beach and surf trips to places like Playa Grande for intermediate surfers and Witches Rock and Ollies point for the more advanced surfers looking to challenge themselves. Considered the surf "mecca" of Costa Rica, Tamarindo surfing has enticed surfers from around the globe for decades. The pleasant warm waters of Tamarindo are favorable for any range of surfers. The long and clean curls from the Tamarindo bay are perfect for any beginner. In fact, the beaches of the Tamarindo area are ranked top 10 of the best beaches to learn to surf. The Real Deal Tours, offer private surfing lessons or group surfing lessons with the best surfing instructors in Tamarindo. Not a surfer? Take a sea kayaking or Stand Up Paddle tour instead. 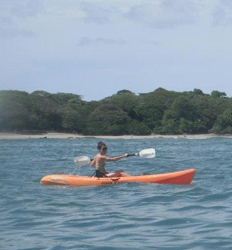 We offer sea kayaking in Tamarindo and SUP & Kayaking at Flamingo beach that take you to explore the bays and islands just offshore in this breathtaking region of Guanacaste. Looking for a bit more action? Try some of our popular motorized watersports such as Jet Ski rentals or parasailing in Tamarindo bay. 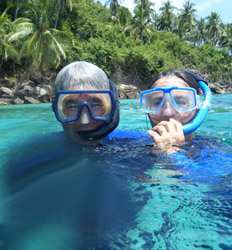 Or test your hanging power on a Tamarindo banana boat tour or our selection of other super fun inflatables. Not enough, try out the super fun Tamarindo Flyboard and soar above it all!! So what are you waiting for? Get in on all the action and take your pick of our Tamarindo watersports listed below! 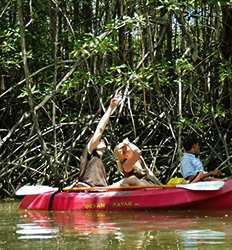 Tamarindo Surf Lessons deposit is $14.00 per person for the Private Tour and $7.00 per person for the Group Tour. Tamarindo is arguably the best beach to learn to surf in Costa Rica, but our top notch surf instructors in Tamarindo cannot be beat. Get one on one private surf instruction, pair up with a partner to challenge each other on the waves, or bring the whole group along to surf in Tamarindo. 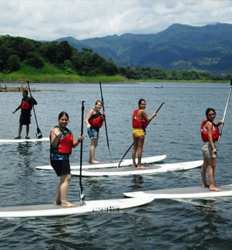 Our Tamarindo Beach surfing lessons will open up the world of surfing in Costa Rica to you this vacation. Group Surfing Lessons deposit is $8.00 per person.